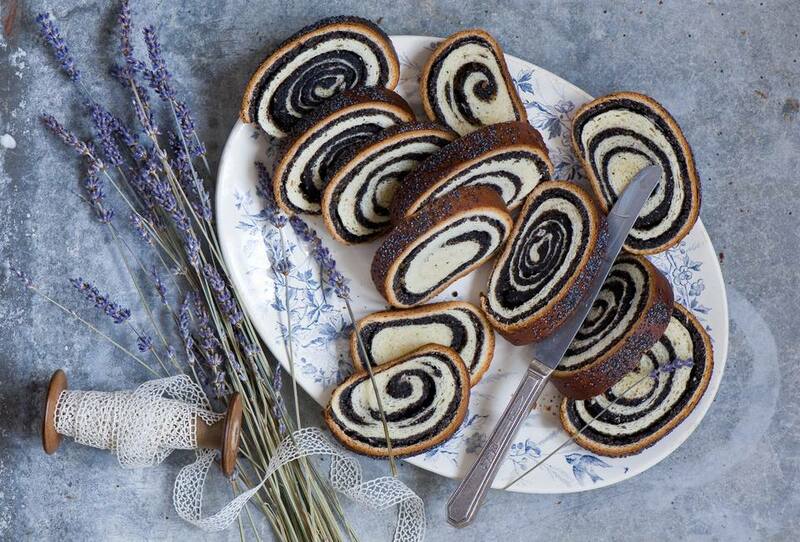 This Polish recipe for poppy seed roll is known as topielec or drowned cake because of the interesting technique used. After the dough is mixed, but before the sugar is added, it is gathered into a ball and "drowned" in a bowl of cold water until it rises to the surface. This recipe was taught to me by Zofia from the town of Rogoznik in the Podhale region of Poland. I am giving this recipe in a combination of weights and volume measures. It would be a good idea to weigh the flour, butter, and yeast. In a small bowl, mix the yeast with the sour cream. In a large bowl or stand mixer, combine the flour, butter, egg yolks, whole egg, and sour cream yeast mixture until well mixed. Gather into a ball. Fill a deep bowl with enough cold water to cover the dough ball by several inches and drop it in. When the dough ball rises to the surface (it usually takes about 20 minutes), remove it from the water and dry it off slightly with paper towels. Place back in the mixing bowl and add the 1 cup sugar until well combined. Divide the dough into 3 pieces and roll each out on parchment paper to about 1/4-inch thick. Spread with filling. Place poppy seeds in a large bowl and pour boiling water over to soften for 20 minutes. Drain and grind poppy seeds in a mortar and pestle. Place ground poppy seeds in a large bowl and add 7 ounces softened butter, 2/3 cup sugar, raisins, 5 egg yolks, cherry jam, almond extract, and oil. Mix well. Fold in egg whites. Heat oven to 325 degrees. Using the parchment paper as an aid, roll the dough away from you until you have a cylinder. Wrap this same parchment paper loosely around the roll. Repeat with remaining dough. Place 3 poppyseed cylinders on a baking sheet, spaced 2 inches apart. Let rise 30 minutes in a warm place. Bake 50 minutes. Cool in paper on the pan. Cut paper away, slice and serve.